Wedding Flowers Over 20 years of Melbourne Wedding Flowers industry experience, we have created all styles of wedding flowers package to suit every wedding design, theme, colour and tailored to each wedding flowers budget. Our Team work closely with the bride and groom, the wedding ceremony and reception venue co-ordinators to achieve successful wedding flowers story, expression, presentation and on time flower decorations. 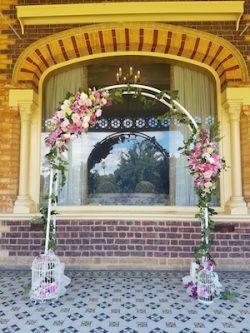 Events Hire, delivery and set up of wedding ceremony flowers for wedding backdrops, wedding arch, chair ribbons and ties, glass vases, hanging ceiling flowers, table flower centerpieces at wedding receptions, beach weddings, winery weddings in the Yarra Valley, Mornington and Melbourne areas. Besides Fresh Flowers, we also offer Silk Wedding Bouquets, Flower Crowns, Buttonholes and Corsages for the bridal party, Real Touch Artificial Flower Arrangements and Silk Flower Centerpieces for wedding ceremony and wedding reception venue flower decorations and set up. Meet with us today for a free wedding flowers consultation. Call Sophia on 0402240235 for appointment availability. Or send an email with photos of wedding dress, bridesmaid’s dress, favourite flowers, budget, wedding theme to sophia@sophiakueh.com.au Follow us on Instagram, Facebook and Pinterest. Fresh & Silk Flowers, Plants delivered to homes, retail shops, offices, churches, all funeral homes (Le Pine Box Hill, Le Pine Glen Waverley, Le Pine Ivanhoe, Le Pine, Kew East, Le Pine Camberwell, Le Pine, Croydon, Tobin Brothers Doncaster), Botanical Gardens, cemeteries, aged care homes and hospitals across Melbourne. Same Day Flowers Melbourne Flower Delivery Areas : Melbourne CBD, Melbourne Inner City Areas, East Melbourne, North Melbourne, Flemington, Carlton, South Melbourne, South Yarra, Richmond, South East Melbourne, all Eastern Suburbs of Kew, Camberwell, Balwyn, Doncaster, Templestowe, Blackburn, Forest Hill, Viewbank, Greensborough, Rosanna, Heidelberg, Ivanhoe and surrounding areas. We have started delivering to Ballarat, Geelong and Surrounding suburbs past Westgate Bridge and Western Highway in 2018. Areas include Ballarat, Bacchus Marsh, Ballan, Mt Helen, Brown Hill, Wendouree, Sebastopol, Mt Clear, Bunninyong, Redan, Alfredton and surrounds. Order by 2pm for same day flower deliveries 7 days a week. Orders after 2pm can be arranged with late delivery charge or for standard delivery the next day. Please specify the date of delivery and any specific request on comments box upon check out. Flowers are seasonal. We reserve our right to substitute flowers or vase due to unavailability on the day but always keeping the optimum in freshness and design appeal. Funeral Florist specialist. We specialise in Funeral Flowers Delivery to all funeral service at funeral homes, cemeteries, crematoriums and all Melbourne residential areas. Early morning funeral flower deliveries can be arranged. Hospital Flowers Delivery to Mitcham Private, 27 Doncaster E Rd, Mitcham VIC 3132, Austin Hospital, Mercy Women’s Hospital, 145 Studley Rd, Heidelberg VIC 3084, Box Hill Hospital, 8 Arnold St, Box Hill VIC 3128, Women’s Hospital, Children’s Hospital, Parkville, The Alfred, St Vincents, Fitzroy and all hospitals, aged care homes and residential areas in Melbourne, Victoria. Flowers gift baskets & Hampers filled with suitable gifts for all occasions, from baby flowers gifts to helium balloons, chocolate additions, gourmet food, Christmas flowers food gift hampers, corporate gift baskets, romantic gift hampers, mothers day gift baskets and more. Ask our Customer Service for Custom Gift Hampers for all occasions. We are premium Melbourne Wedding Florist offering Wedding Flowers Package Price with creative, affordable and beautiful wedding flowers decoration. Package Pricing applies to bridal party flowers, wedding ceremony (backdrop & aisle) and reception guests and bridal table flower arrangements included. Includes Bridal Bouquets, Wedding Buttonholes and Corsages, Wedding Cake Flowers, Wedding Hair Flowers, Wedding Car Flowers, Wedding Ceremony Backdrop Flower Decorations, Wedding Pew Ends, Aisle Flowers, Chair Flowers, Wedding Reception Flower Arrangements, or Wedding Table Flower Centerpieces. We have a wide range of wedding table centrepieces for hire – golden candlesticks, silk flowers centrepieces, glass vases and more. Wedding flowers Delivery, including Sunday/Holiday Wedding Flowers Delivery, Set Up and Clean Up available upon request.